The Tracy Chapman site was another project I developed with Ordinary Kids when I first moved to San Francisco in 2008. 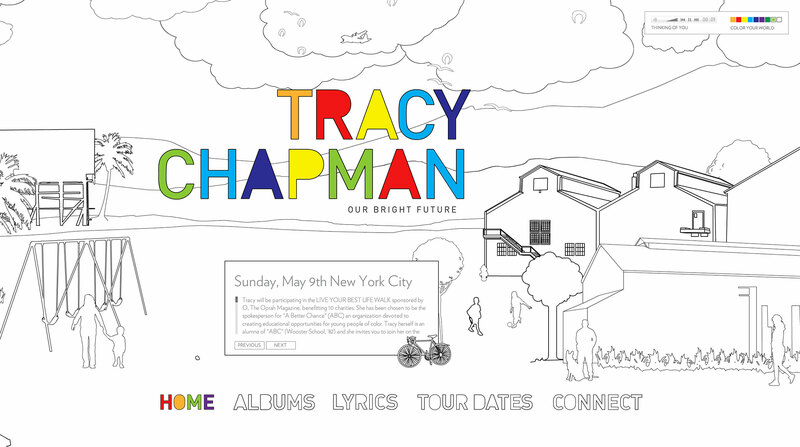 The site is a paint-by-numbers style coloring book that allows visitors to create their own custom version of the site while listening to Tracy's music. The interactivity combined with the juxtaposition of positive and negative elements throughout the site were designed to reinforce the message in the title track of Tracy's 2008 album "Our Bright Future". The site was one of our most successful projects at Ordinary Kids garnering over 50,000 unique monthly views and received industry recognition from multiple outlets including Adobe, Communication Arts and the FWA.